The Decision to Fund Bulldog Boulevard Improvements is Down to the Wire! A month or two ago, we told you about the major improvements that were being planned for Bulldog Boulevard. These improvements would dramatically improve safety for a road that is seven times more deadly than average, beautify this ugly street, and, as council member Dave Sewell put it, save lives. However, those improvements may not happen without your voice. Sadly, many residents intend to keep this street the high-speed, wide-open road is now is. This would maintain the high level of traffic crashes–more than seven times the state average–and continue to discourage cycling. These people have already blasted the city council with messaging in opposition of the project. What do they oppose? An increased car travel time of only four seconds in one direction and forty seconds in the other during peak traffic hours. That’s a small price to pay for safety. Because of that opposition, the council is split on the decision to fund the project. Currently, three of the seven council members are opposed to the project and one is still undecided. This is too close to call. Attend the City Council Work Meeting tomorrow (Tuesday, June 19) and voice your support. 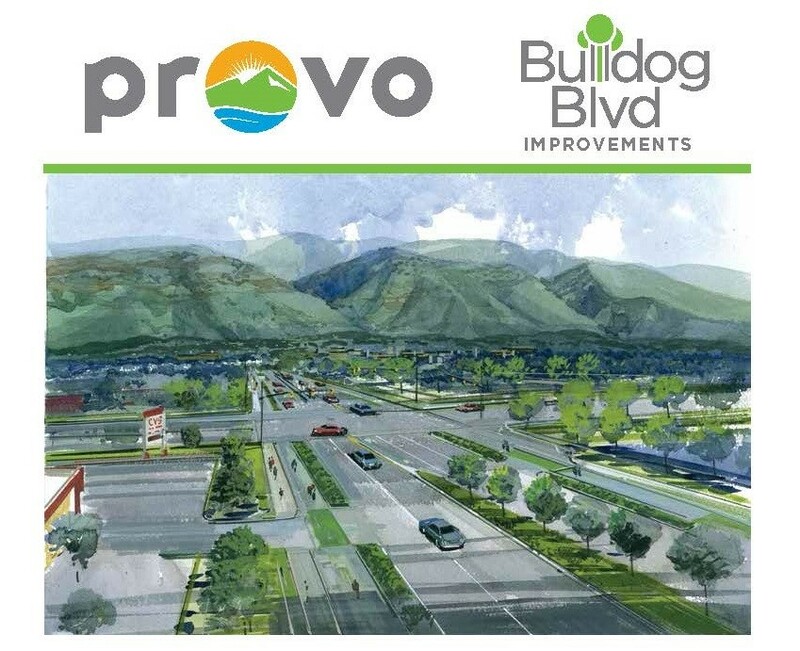 We estimate the City Council will begin talking about Bulldog Boulevard at 2:20pm. Email the City Council to voice your support of the project if you cannot attend. Send your message to council@provo.org. Key talking points in support of the project include safety improvements and city beautification. If you drive a car on that road, please mention how unsafe it feels in a car currently. Don’t wait!Your inaction could cause this project to fail. Join us in voicing your support today! We need your help this week. Please come to the 500 W Public Hearing. Wednesday, October 11th. 5-7pm at Provo High School. The concerning feature of this design is the new wider, rounded corners at intersections. 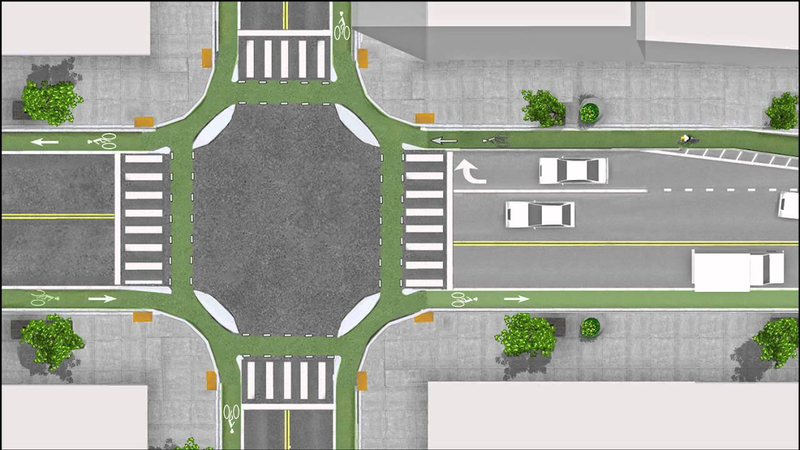 Neighbors are worried because the rounded intersections create longer, less reliable crossings for pedestrians. They also encourage cars to speed through right turns. This plan makes school crossings to Timp Elementary even more dangerous for students that will no longer have a pedestrian crossing tunnel. If the hospital staff needs an entire ped overpass on this street, our kids should at least have ground-level intersections designed for safety. What is the Neighbors’ Preferred Design? 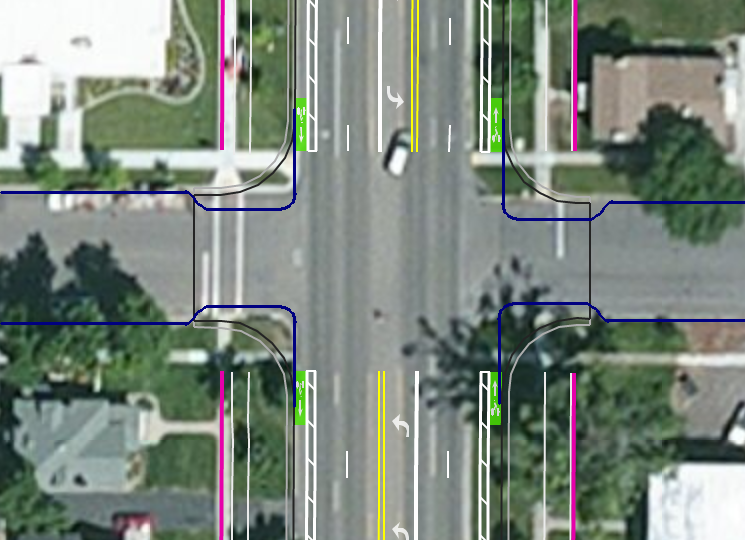 A group of neighbors would like to see 500 West intersections designed with bulb-outs or pork chops, two features that would protect children walking to Timp and families crossing the street elsewhere. The benefits of these design features include shorter intersection distances for people walking, pushing strollers, etc. Crossings are more obvious and right turns are taken at a less-accelerated speed. This is a more reasonable compromise for Timp students that will be losing the pedestrian crossing tunnel to their school. – Come to the 500 W Public Hearing. Wednesday, October 11th. 5-7pm. Provo High School (1125 N University Ave.) Be sure to leave a written comment about your pedestrian safety and intersection preferences. You can come for just a few minute to leave a comment; you do not need to stay the entire time. It is an informal walk-through open house. – Send your comments to UDOT. Email provo500w@utah.gov and also share your comments with bikeprovo@gmail.com. This is a chance to make a big difference and everyone’s voice counts. 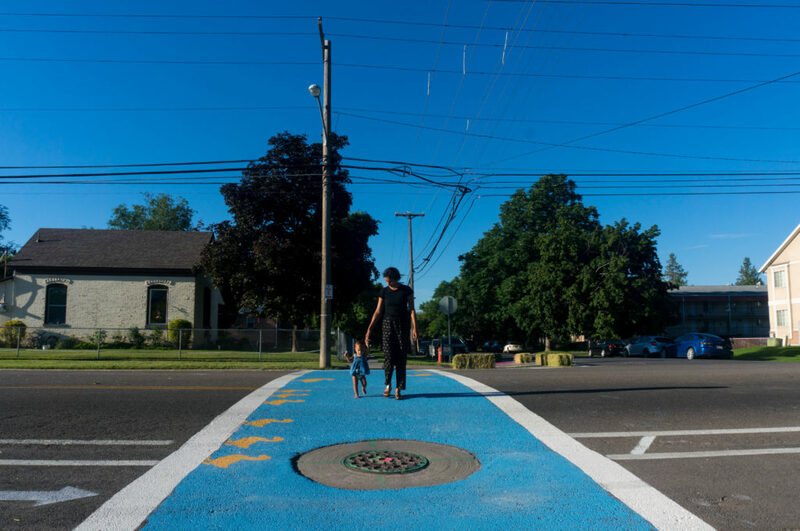 The more people that speak up, the better our opportunity to create a safer street. Thank you for your support and willingness to show up when we need it most! 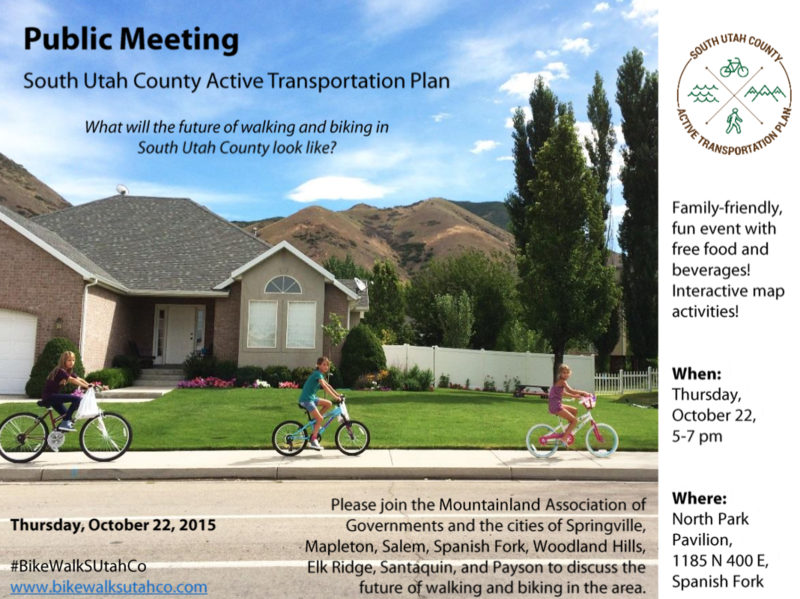 Please consider attending this public meeting to learn about the future of biking in cities to the South of Provo. 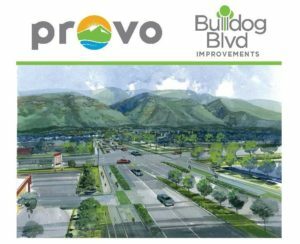 Although they aren’t discussing Provo in general, this would be a good place to give input if you want to talk about connecting trails and lanes between our cities or any south projects you may be interested in. 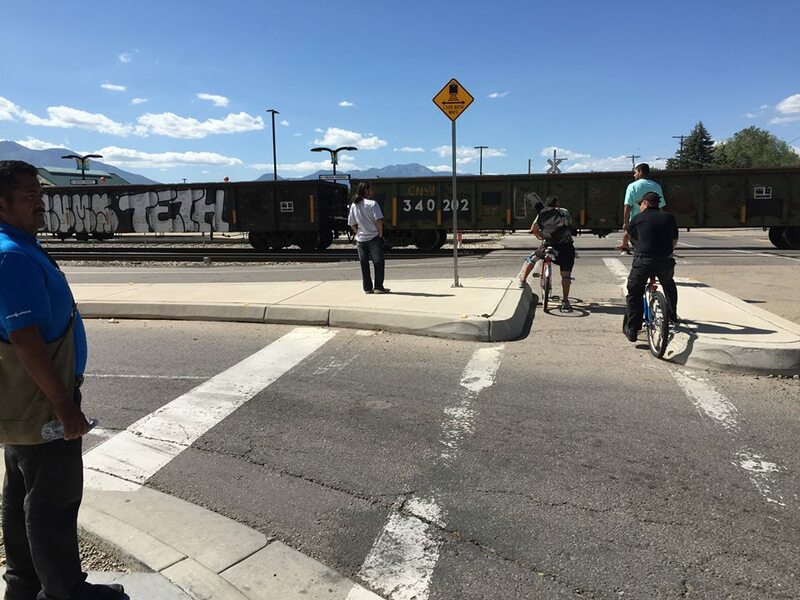 Anyone that uses the Provo FrontRunner station regularly is aware of this problem: freight trains regularly sit on the tracks, blocking every North / South intersection that could be used to get to the FrontRunner Station. 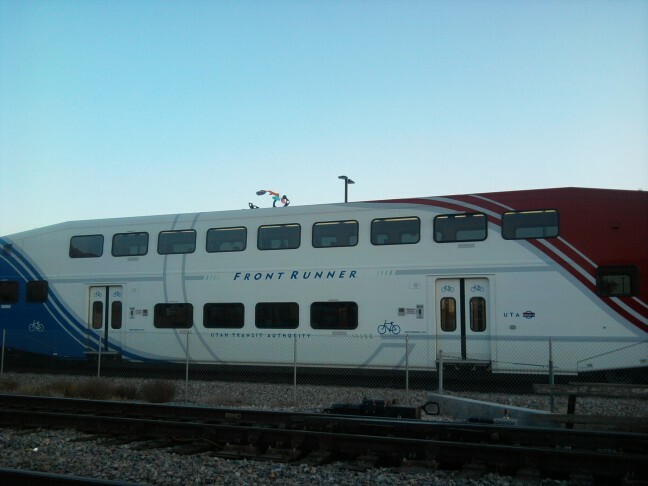 Commuters often arrive early, watch their FrontRunner train pull into the station, wait for 15 minutes, and watch their train pull away without them. All while blocked by the freight trains. 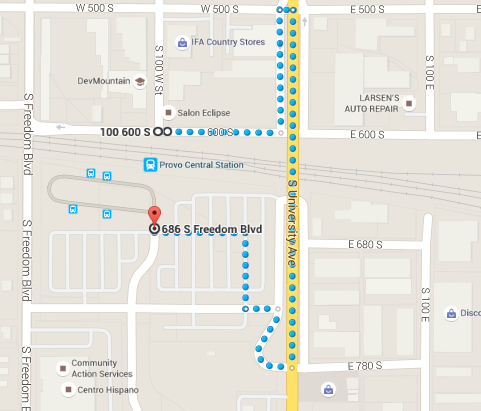 Some Provo residents simply avoid taking the train because of the unpredictability of a blocked route to the station. Others have become frighteningly comfortable with climbing over the freight trains in business attire, hoisting their bicycles over the non-moving trains, and even passing young children in between train cars. What’s worse is that many times people are climbing over the freight trains and jumping onto active tracks – unaware that another freight train may be headed their way. Why Hasn’t UTA Taken Care of This Before? How Can They Pay for It? The big reason that UTA hasn’t taken care of this problem seems to be cost. A pedestrian / bicycle bridge to the station would be somewhat expensive. 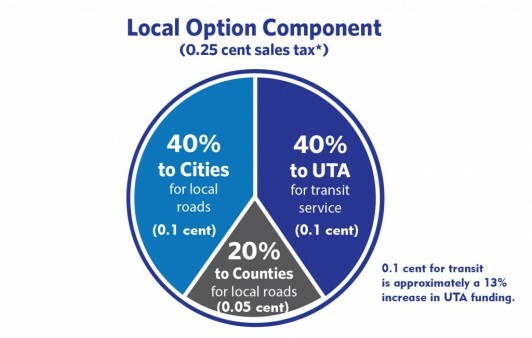 One way that UTA could fund an overpass would be to use Prop 1 funds if voters pass the initiative in November. At a recent meeting, UTA representatives said that their priority would likely be to spend the funds on extending service on bus routes unless they heard otherwise from Provo residents. And, as you’ll see below, Provo residents have been pretty loud and clear about the need for the overpass. 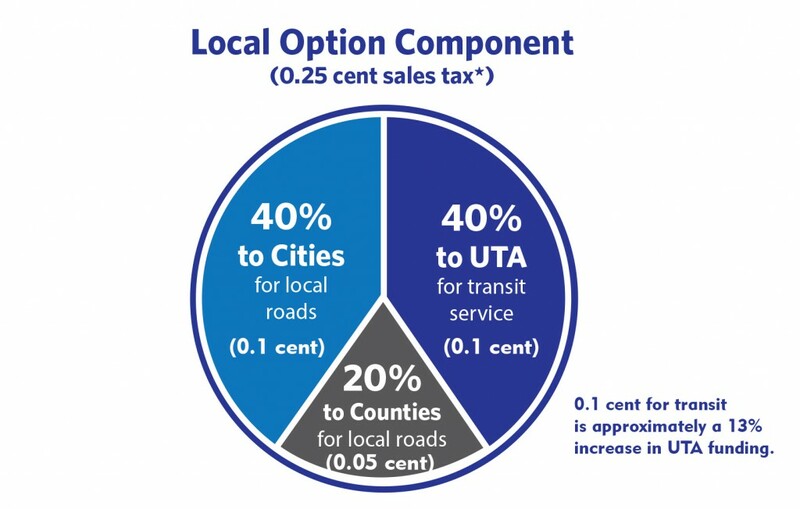 If Prop 1 passes, expenses could conceivably be shared between UTA, the city, and the county (each entity receiving a portion of the funds). However, this should be a UTA priority no matter how the vote goes. Yeah, But Why Don’t People Just Cross at University Ave? When freight trains are stopped in front of the station, generally all other crossings on that stretch are also blocked. Getting to the University Ave. overpass may be a few minutes of annoyance in a car. But, on foot or by bike, it is too far. Trying to get to the station with kids or in business dress (heels…yikes) by walking an extra half mile is an obstacle that stops a lot of people from feeling that the FrontRunner is a consistent, reliable alternative. One of UTA’s goals is to reduce the first mile / last mile problem – the problem that many people don’t use public transportation because they don’t have an accessible way to reach it without walking a mile there or walking a mile from transportation to their destination. Reducing the extra half mile that is added when people have to walk to the University Ave. overpass will be an excellent step towards that goal. It’s also important to note that the sidewalks on the University Ave. auto-bridge are extremely narrow. Two people passing each other is awkward and even dangerous when one steps out into traffic, not to mention bikes or strollers trying to navigate the area. (Even getting on the bridge as a pedestrian takes an act of courage as its entrance is marooned in the middle of the street with road on both sides and no crosswalks). 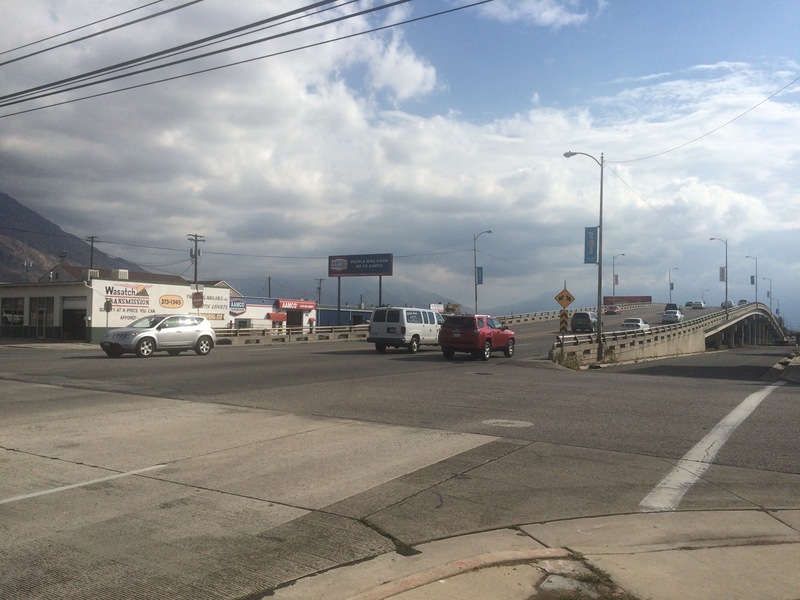 Where Would a Provo FrontRunner Overpass Go? UTA would have to work with the city to figure this out. 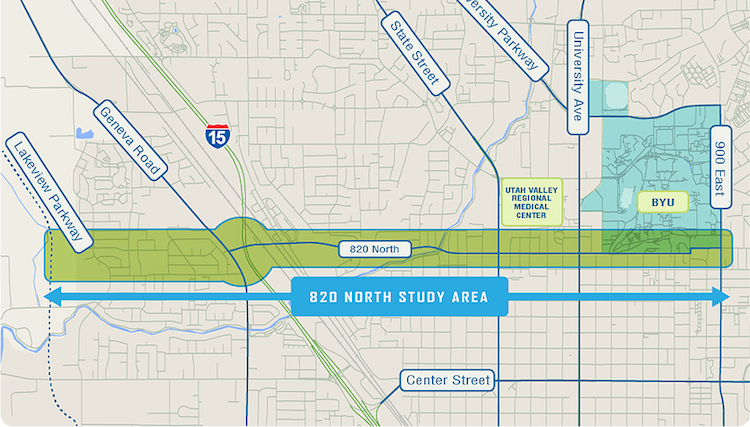 An ideal location would be 600 South and 100 West. 600 South and Freedom Blvd. could also work. Is There Public Support for a FrontRunner Overpass? What Can Provo Residents Do? There’s clearly an outpouring of support for an overpass. You can check out their survey to read even more responses. Please help get the word out by sharing this info however you can. Please also consider submitting your own survey answers and help us work together with UTA, Provo City, and the county to take care of this long overdue problem. Thanks to Chloe Jensen, Paige Marie Pitcher, and Karen Tapahe for the photos and videos of people stuck behind and climbing over trains. 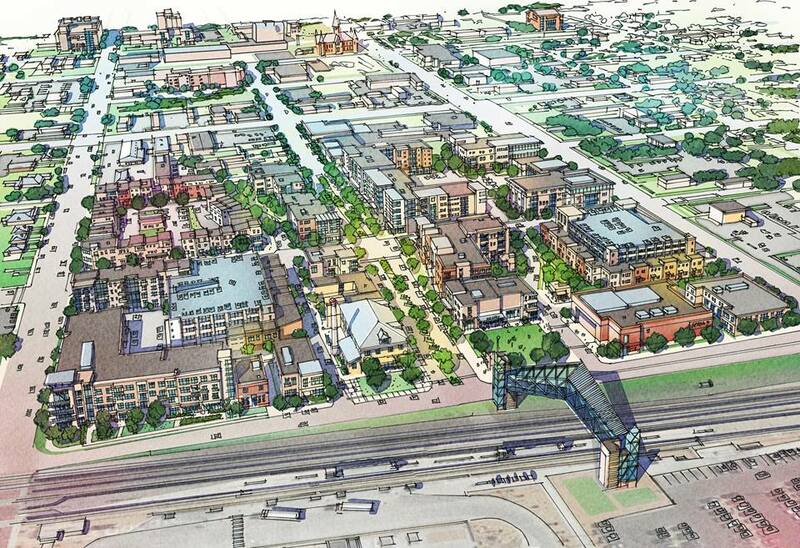 Thanks to Urban Design Associates working with the Giv Group for the artistic rendering of a potential ped / bike overpass. ACTION ALERT: Please Talk to UTA TODAY! UTA reps were surprised that very few people from Provo showed up. (There was a lot going on politically that particular night, but they aren’t connected to that). They noted that, in contrast, Lehi packed the house. Reps said they hadn’t thought of using some of the Prop 1 funds for a ped / bike overpass to the FrontRunner station. 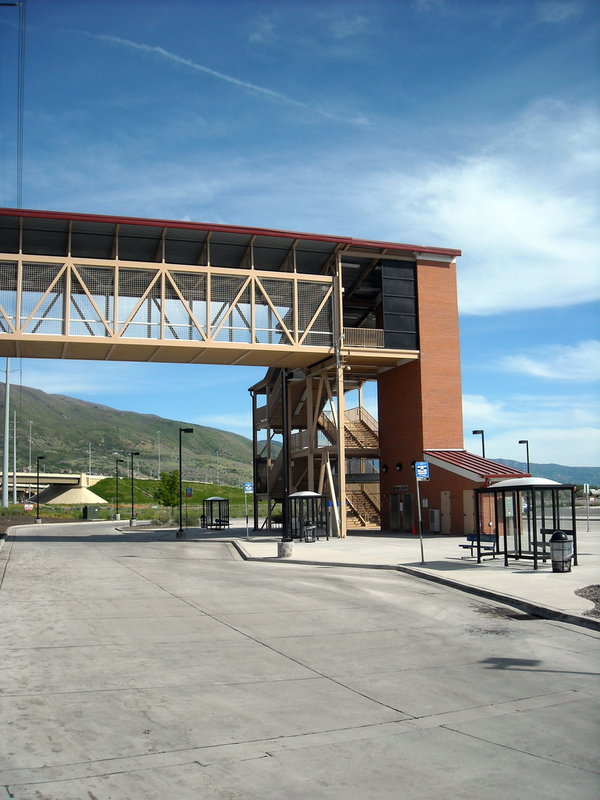 In fact, while an overpass had been previously considered as a possibility for a past project, they seemed unaware of how many people in Provo are jumping over the Union Pacific trains to get to the station or go about their usual business. UTA reps said that if what Provo really wanted was an overpass to the station, we should prove it by encouraging people to fill out the online survey, noting this in the final fill-in-the-blank question. 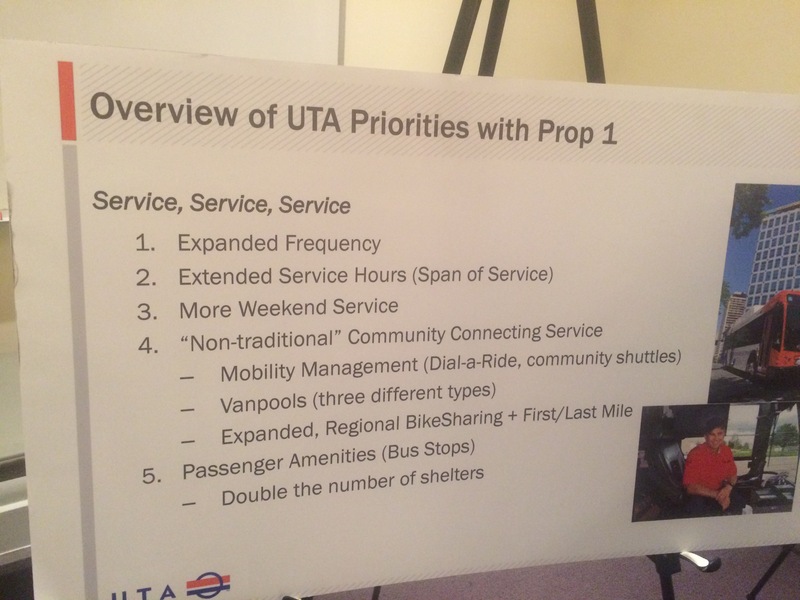 Otherwise, their priority for Provo is likely to be spending more on bus frequency. If you want to help us get an overpass, now is the time to act. Please fill out this online survey today. 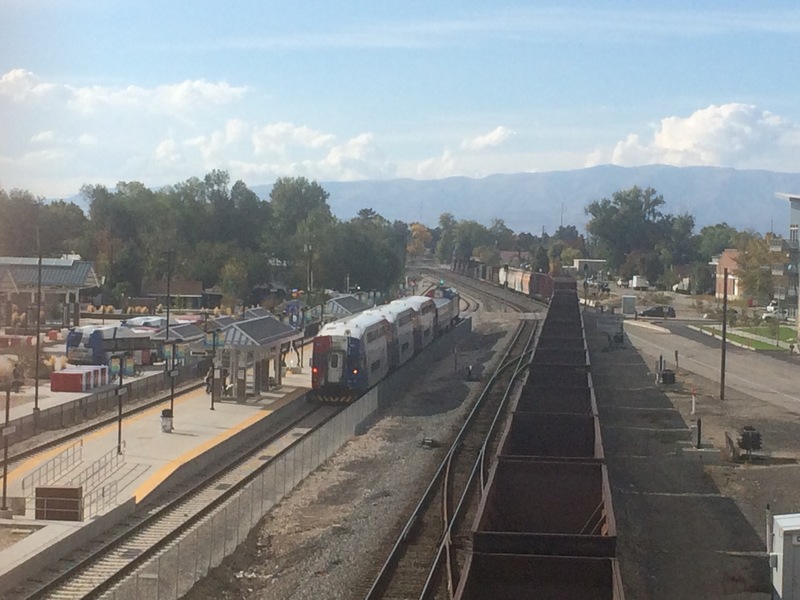 And, if you didn’t go to the open house yesterday, please consider going to the open house tonight Thursday Oct. 8th from 4 to 6:30 p.m. at Provo Station, 690 S. University Ave.
Now is your last chance to weigh in on how you’d like to see UTA use transportation funds in Prop 1 passes in the November election. We’ve talked about the UTA survey before. If Prop 1 passes this November, shoppers will be paying one cent on this .25 of a cent (that’s a quarter of one cent, not twenty five cents) that may be used for active transportation projects including bicycle infrastructure. How should the money be spent? We’ve talked about this in a previous post, but I thought I’d bring up the idea here too. One project that almost everyone can agree with is a pedestrian / bicycle overpass connecting the city to the FrontRunner Station (and eliminating the need for dozens of people to jump over the Union Pacific trains on an almost daily basis). Union Pacific trains block access over multiple intersections, sometimes for up to an hour. That means that people trying to get to the FrontRunner station using any method other than a car are marooned as they watch their FrontRunner trains pull into the station and leave without them. Please come to the meeting and share your thoughts! The more people that talk to UTA about this problem, the more likely we’ll end up with a timely solution.